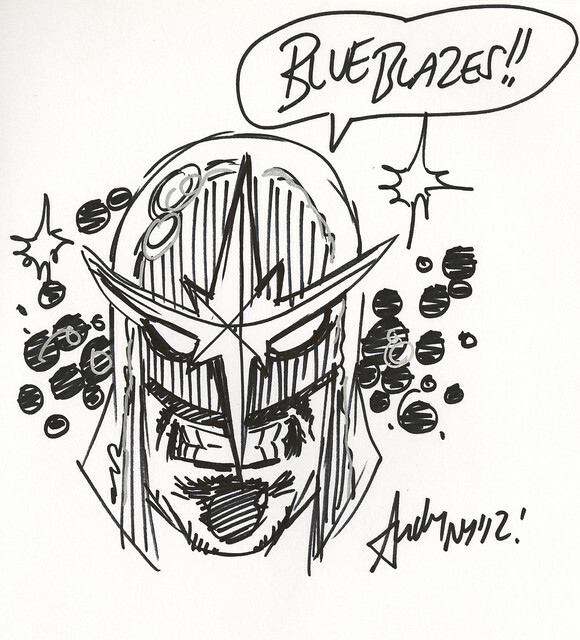 British comics writer/artist/inker/all around awesome guy Andy Lanning drew this headsketch of Nova for me. I love how he was able to add some silver Sharpie squiggles, adding an awesome effect to it. But what was equally awesome about Andy was the face that he took the time to answer all my silly questions about his writing practices and habits. I was a fan before, but he certainly made a fan for life out of me! Let’s face it; professional wrestling and comic books are very thematically similar. Pro wrestling is a lot like comics coming to life, filled with heroes and villains (clad in over the top costumes) battling for supremacy. Even their fanbases overlap; they’re both constantly criticized for liking something many disregard as something you should have given up by the time you turn seven. Anyway, it’s no surprise that the professional wrestling world would be represented at Comic Con last week. Both WWE and Impact Wrestling were out in full force. But WWE took it one step further, expanding one of their angles (wrestling speak for “storyline”) during one of their panel presentations. During the presentation, wrestler HHH (who now runs the WWE in story) gets interrupted by WWE champion CM Punk, who himself is an avid comic book fan. In the WWE storyline, Punk won their championship on his last night wrestling for the company and is keeping the title high-jacked. The question is when—or will—he return to the WWE, and by having him harass it’s on-screen chairman only keeps this moving. It was a nice little way to make those in attendance feel like they’re part of the story.